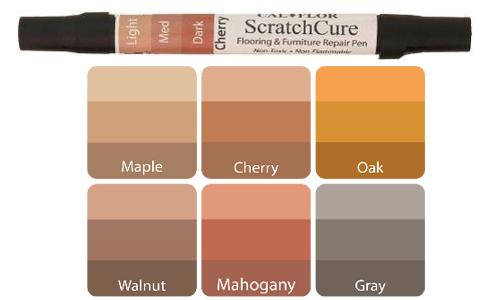 Cover scratches in your wood floors and furniture with the Cal-Flor ScratchCure repair pen! This hardwood scratch remover can even cover up white wood stains. This versatile repair product can even be used as a laminate scratch remover and vinyl flooring scratch repair. What makes this wood scratch repair pen above all others is the ability to build up colors with more coats of the products. Go from light oak to dark oak with one repair pen! With a longer drying time, you are able to wipe away unwanted marks. This furniture scratch repair product is ideal for laminate, wood, and vinyl. Use this wood scratch repair pen on floors, fixtures and countertops constructed of wood, laminate, tile, stone and vinyl. - For lighter colors start with one coat at a time, wiping with dry cloth between applications. - For darker colors multiple coats will be needed, buff color between coats with a dry cloth or towel to ensure even color saturation. - Dabbing with the pen tip will darken areas even more. Not sure which color to choose? Pick a lighter wood scratch repair pen color and build to a darker finish. Make your furnishings look new again with the ScratchCure furniture scratch repair product! 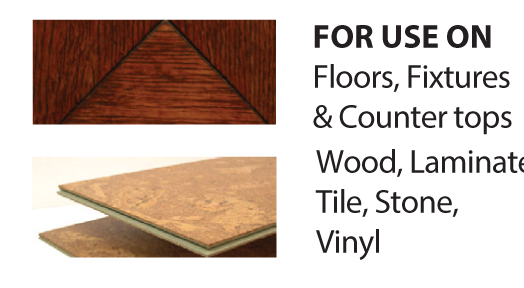 Looking for other products to cover scratches in your wood surfaces? Browse our full line of hardwood scratch remover products.